I love yoga. Since having B, my practice has severely diminished. 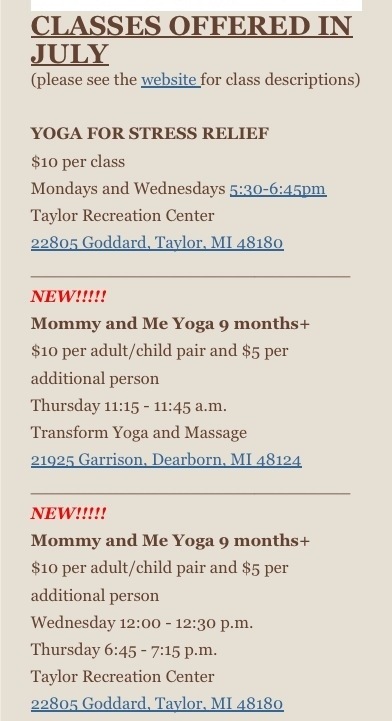 However, recently a new class has become available in the Dearborn/downriver area that I love. I just had to shout it from the rooftops! 1. It’s CASH ONLY and drop-in, so no commitments. 2. They have mats and blankets for you to borrow. 3. You don’t need special clothes because, if you’re like me, you’re probably already in yoga pants everyday, right?! It’s ” mom & tot” so, if your kid is like mine and feels the need to run, skip, yelp or fart, it’s okay, you’re amongst those who understand! If you have two little ones, it’ll cost you $5 more, but don’t feel like you can’t attend because you can’t “control” both of them. This class is designed for little ones with even littler attention spans. No one expects your little ones to just stay on their mat. Mom gets a few poses in while junior may be trying to climb your tree pose or limbo under your down dog, that’s okaaaaay!!!! It’s still having a positive effect on your family, I promise. B takes the best naps when we go. Where have you done mommy & me yoga with your little one?